I took the sweet citrus flavour of Paska, or Easter Bread, and baked some amazing gluten free Paska Rolls. 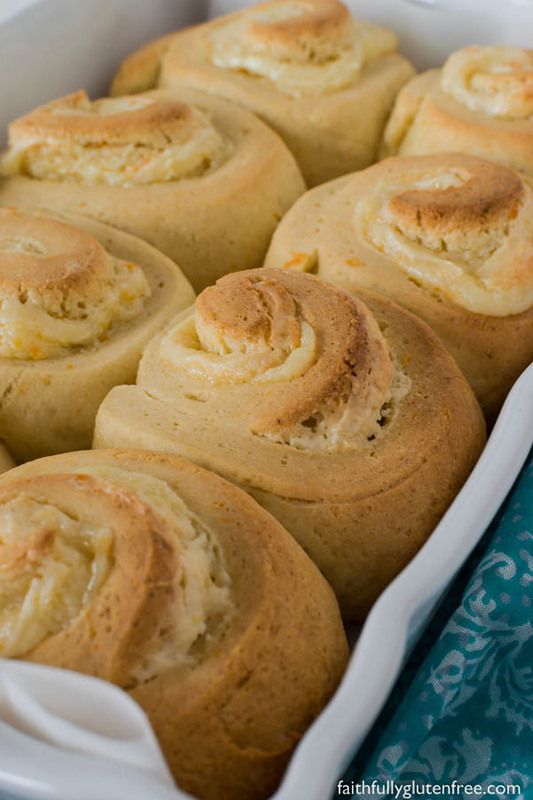 Filled with a delicious cream cheese and citrus zest filling, these rolls would be perfect for Easter brunch. Paska is a sweet, citrus bread that I’ve always enjoyed during Easter. Growing up in a Mennonite family, my Grandma used to bake large loaves of Paska in coffee tins. My Mom took a slightly different route by baking Paska buns. I decided to to add my twist to this traditional Easter bread by incorporating those flavours into gluten free Paska Rolls. Paska is traditionally eaten during Easter. Some versions have just lemon zest, but I grew up with it having both lemon and orange. Sometimes Paska is topped with icing and sprinkles (this is a must, if you ask me), other times it’s icing and coconut. There are many different variations, but the lemon and orange combined with the cream cheese is pure perfection, in my opinion. The method for these rolls is the same as The Best Gluten Free Cinnamon Buns. 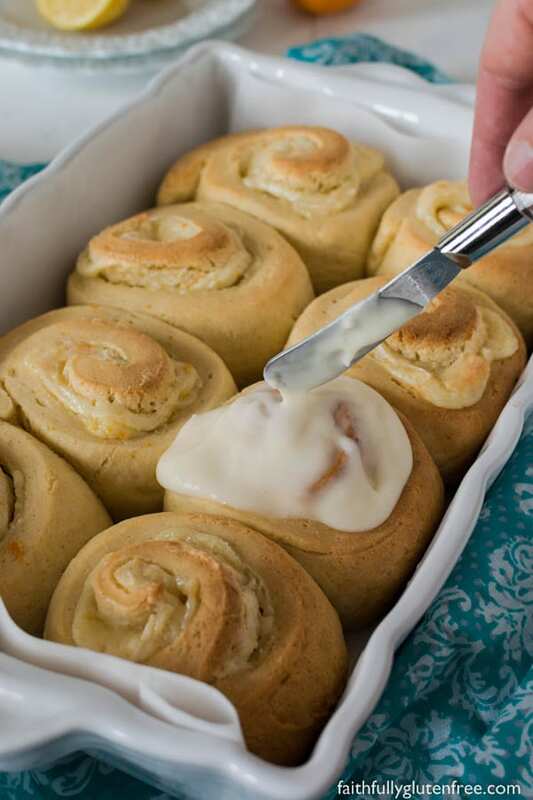 If you have any questions about these rolls, feel free to read through to 150+ comments on the Cinnamon Rolls. You can also watch a video of me making another cinnamon roll, and that will give you an idea of what the consistency of the dough should be, and how to work with it. 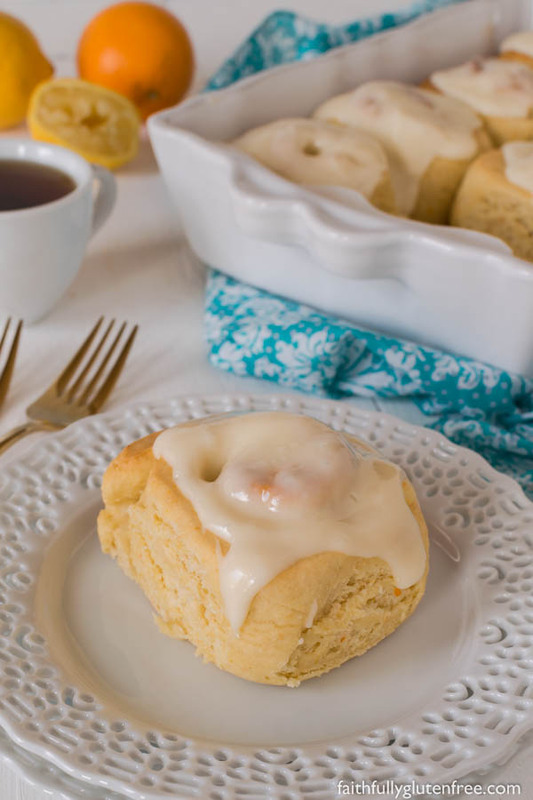 If you are wanting to indulge in these sweet gluten free Paska Rolls for brunch of breakfast on Good Friday or Easter Sunday, you can save yourself some time by making them the night before. Follow the recipe as written but stop when it says to let the rolls rise before baking. After you have formed the rolls, cover the top of your baking pan with plastic wrap or foil, and place them in the fridge. This will slow the yeast down, letting you have the perfect rolls by morning. 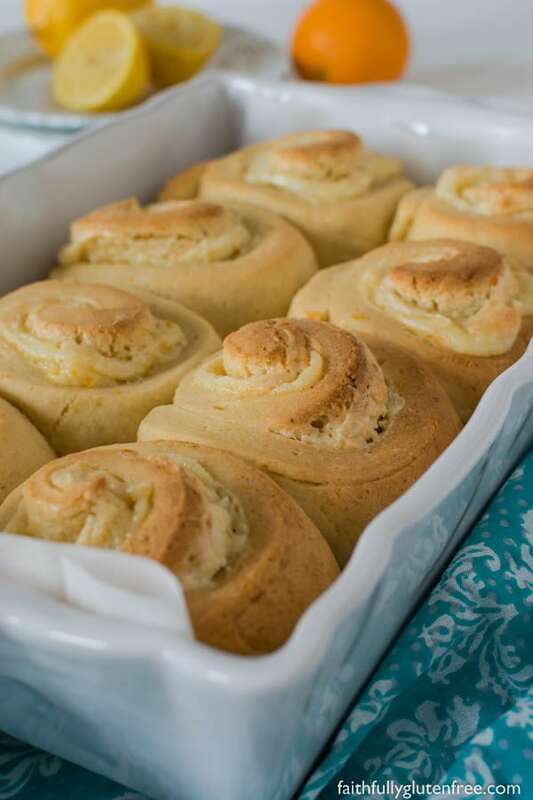 In the morning, when you want to bake the gluten free Paska Rolls, you’ll want to remove them from the fridge and let them rise in a warm place. It may take a little longer for them to rise, since they were in the fridge, so give them at least an extra 10 minutes or so. Now you can just follow the recipe as written, following the bake temperature time as written. NOTE: You may add 1/2 cup shredded coconut to the filling (optional). Line a 9x13-inch baking sheet with parchment paper (I actually just found a new baking pan that is about 7x11-inches, and it is the perfect size, so if you have something similar, you can use that). Set aside. Turn your oven light on, and turn on your oven to the lowest heat. Once it is just warm in the oven, turn the oven off. This will help your yeast bread to rise nicely before baking. Put 1/2 cup milk and 1/4 cup butter in a glass measuring cup and microwave just until the butter has melted. Remove from microwave and stir. Add 3/4 cup milk, stir. Add other wet ingredients and whisk to combine. Allow to mix on medium speed for 2 minutes. Take a piece of plastic wrap and lay it out on a slightly damp counter top, so it covers an area bigger than 8″ x 16″. Sprinkle about 2 tablespoons of sugar on the wrap. Scrape the ball of dough on top of that. Gently lay another piece of plastic wrap over the top of the dough. Pat the dough down into a roughly squarish shape. Lift and re-position the top plastic wrap whenever you need to. Roll the dough out (with the plastic wrap on top) to a square approximately 8″ x 16″. 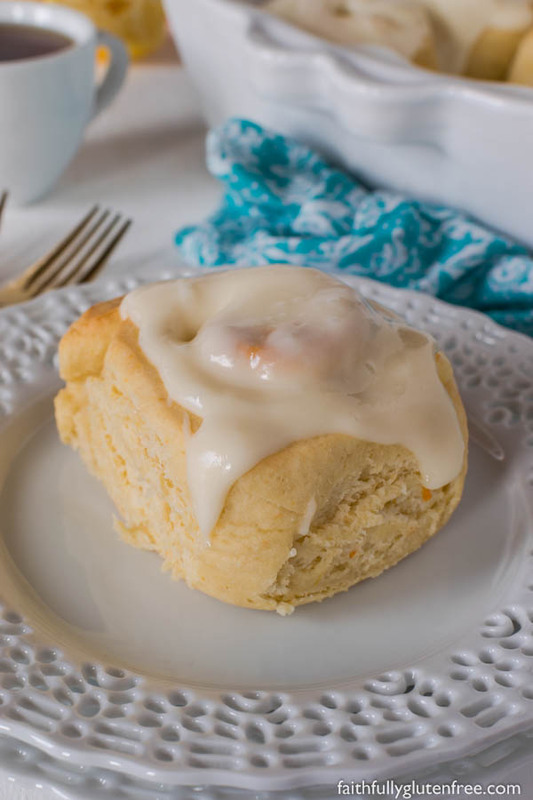 Stir together the cream cheese, 2 tablespoons butter, 1/2 cup sugar, and lemon and orange zest. Carefully spread this mixture over the dough, leaving 1 1/2″ along one long end without any filling, this is where your rolls will be sealed. Using a long piece of dark thread (light colours can be lost in the dough), cut the long "log” into 8 pieces, about 1 1/2″ wide. You can do this by placing the thread underneath the roll, crossing it at the top, and pulling the threads so they cross each other, pulling it through the dough. This way, you won’t be squishing your dough down by cutting with a knife. Place rolls in prepared pan, with cut side up. I like to push the rolls down to about 1″ high. Allow the Paska rolls to rise in a warm, draft free place (like your slightly warmed oven) for about 30 minutes, or until nearly double in size. Allow to cool for about 5 minutes before topping with the cream cheese frosting, if using. To make the frosting, beat the softened cream cheese, butter, confections' sugar and lemon juice until smooth. Originally posted April 2012. 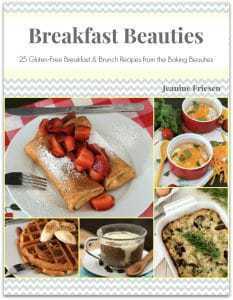 The recipe and images were updated in March 2018. Oh Yum!! Seriously, these look so soft, sweet, and delicious! Must – make – soon. 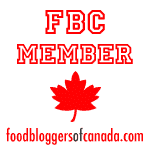 Would the brown rice flour sold at bulk barn be considered “super fine” ? If not, can I use 4 cups superfine white rice flour instead of the superfine brown rice flour, in the AP flour mix. Yes, I consider the brown rice at Bulkbarn to be superfine, that is what I use all the time. 🙂 The flour mix can be made with either white or brown rice flour, but since brown has more nutritional value than white, I use brown all the time. HTH! I don’t remember where I got the idea, but I now use a pizza cutter to slice the dough into strips and then roll each strip separately. It’s sooooo much easier and neater. Oh, and I meant to add, thank you @Lissa for this tip, I may try this on my next batch of cinnamon rolls! Glad to hear that, Tami! Happy Easter! Lissa, have you tried that with this dough? GF dough is so soft, I don’t know if it would work to do that. I find rolling the whole thing up and using a thread works best. Meant to tell you these look JUST amazing!! So impressed at not only your baking skills but your photography!! Nice job gal! Hi! I’ve made (and adore!) 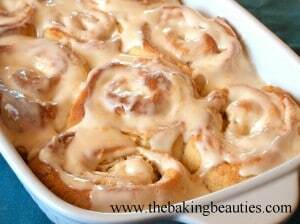 your regular cinnamon bun recipe and your monkey bread…I am curious, does it works to prep these ahead and freeze before rising like the monkey bread? Or prep the night before, refrigerate, and let rise i and bake in the a.m. Before baking? Thank you!!! I ‘think’ it should, since I’ve done it with the cinnamon buns and the monkey bread. I haven’t tried it myself yet though. If you do, please let me know how it works! Did you know? It’s MUCH easier to cut the dough into slices first (I use a pizza cutter), and THEN roll it. I haven’t tried it – I’ve never had a problem with cutting rolls with a thread. 🙂 Thanks for the tip! I’m new to your website, but I am so excited to try some of your recipes! These look wonderful. Since I went (mostly) gluten free a few years ago, I’ve been dying to have panettone again, and this recipe looks pretty similar. Can’t wait to give it a try!! 🙂 Thanks! any idea if you can prep them the day before and cook in the morning? It should work, Christy. Cover them, and refrigerate (before rising) until the next day. Or, make them even earlier, and freeze them, put them in the fridge the night before to defrost, then let them rise on the counter the next day before baking. Amazing recipe, but there is ABSOLUTELY no way prep time is 20 minutes. It might be helpful to change that so that people can plan better. Sorry about that, Meaghan. I prep everything in my head, and roll pretty steady, so I do have the rolls ready in that time, but it doesn’t include rise time – I’ll adjust. We made them for Easter, they are awesome! !